We found this nest on the ground in our backyard this morning. Is it an oriole nest? In the formed nest, there was dryer lint, lichen, thin twigs and grasses, and yellowish lint that seemed to form the inner surface of the nest. We didn’t see any evidence of the chicks or any eggs. We have no idea where this hanging nest was attached. 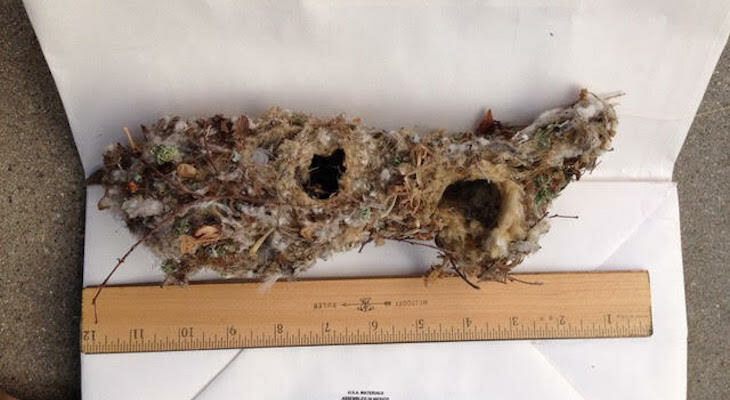 Dryer lint is bad for birds nests, as it doesn't dry out after rains, and gets heavy, causing both moisture and structural problems for the birds. Lovely nest! Thank you for sharing! If we want to leave nesting materials out for birds, consider hair from our brushes. "Both male and female help build the remarkable hanging nest, a process that may go on for a month or more. The nest hangs up to a foot below its anchor point and has a hole in the side near the top that leads down into the nest bowl. The adults make a stretchy sac using spider webs and plant material, sometimes stretching the nest downward by sitting in it while it’s still under construction. They add insulating material such as feathers, fur, and downy plant matter and camouflage the outside with bits taken from nearby plants. While the nest is active all the adults associated with it (the breeding pair plus helpers) sleep in it. They produce 4-10 eggs. Yes, you're right it is Bushtit. After checking more images Hummingbirds' have even smaller openings, the size of a dime or penny rather than the quarter size here. Not an Oriole nest as they hang from branches. Luckily you put the scale there which proves Hummingbird as they'er the only ones with such a small ( 1" ) opening. What a work of art. I wish I knew which kind of bird. If you really want to pursue this, I would ask at the Museum of Natural History. There is certainly an expert there who can i.d. the nest. What was directly above where you found it?